The list of midfield options for Ireland head coach Joe Schmidt is verging on ridiculous. 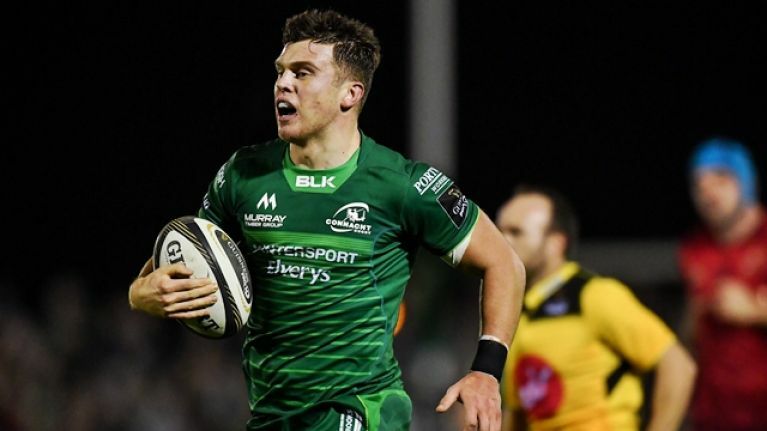 Tom Farrell shaded it over Munster centre Chris Farrell at The Sportsground, on a night that saw Leinster loanee Tom Daly go well in the Connacht 12 jersey and Munster 12 Dan Goggin bag a brace of tries. Add the likes of Goggin, Conor O'Brien (Leinster's man of the match against Ulster), Rory Scannell and Rory O'Loughlin are all doing well for their provinces too. Joe Schmidt is only likely to select four centres for his training squad but a versatile player like Addison can come in and cover a few positions. 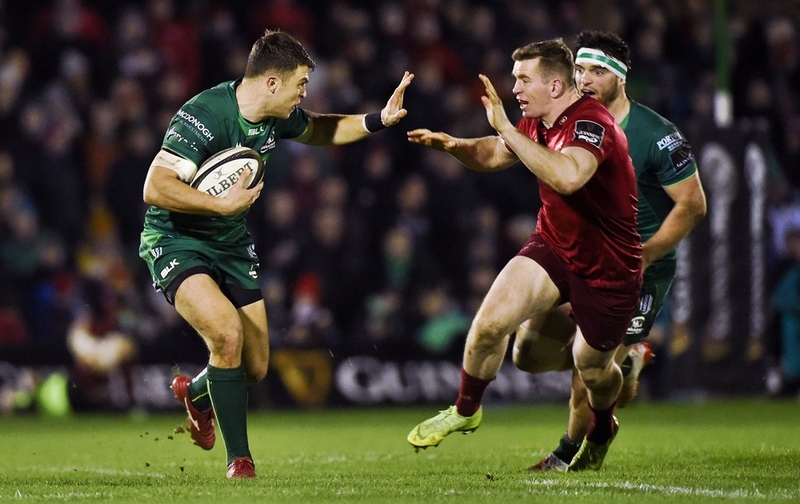 The case for Tom Farrell to be one of the midfielders summoned to Carton House at the end of the month was made stronger by his sterling performance in Connacht's 31-24 loss to Munster in Galway, on Saturday. The Lansdowne clubman had the ball more than anyone else outside of Connacht half-backs Caolin Blade and Jack Carty. He ran 14 of his 24 possessions for 101 metres gained. His ball-carrying included two clean breaks, four defenders beaten, three offloads, one try and one assist. Farrell also secured two turnovers for Connacht, and his first led to the opening try of the game. Arno Botha is a big, burly presence in the Munster back row but he wasn't reckoning on Farrell ripping the ball from his paws. Neither were Keith Earls or Andrew Conway. Both Munster backs were convinced Botha was being brought to ground by Farrell and lept in to clear out the ruck. Farrell had already plundered possession and was away up the pitch. Goggin was the quickest to react but all he could do was cut a line that prevented Farrell from dotting under the posts. It mattered little as Carty converted the try to give Connacht a 7-0 lead. Farrell was not allowing that score to go to his head as, three minutes later, he got into prime poaching position at the breakdown and secured a second turnover. And another couple of minutes after that, Farrell hared up from a starting position on his 22 and stepped inside Peter O'Mahony for another line break. The promising burst was halted, though, when O'Mahony scrambled back to force a turnover from Blade. As 13 for Connacht, Farrell was freed up for attacking plays and hard carries by the hard-working Daly. Having struggled with injuries during his time at Leinster, Daly must be relishing the fresh start. He made eight carries himself, for 23 metres, but he took on a heavy workload in defence, hitting 20+ rucks and sticking 12 of his 13 tackle attempts. Chris Farrell and Dan Goggin were welcome returns to the Munster backline but they were both culpable for Farrell's next line break, just after half-time. Darragh Leader's superb aerial take set up the Westerners for a sweeping attack but Munster's defence looked well set as Carty found Farrell on the charge. The 25-year-old is 6-foot-3 and a few pounds shy of 16-stone but his ability to step, and change direction, at pace is impressive. One jink inside and Goggin was done for. 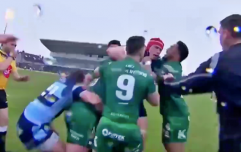 Chris Farrell tried his best to claw the Connacht man back but it was too late and he was away. He drew in Andrew Conway, the last defender, and released Cian Kelleher to score. Farrell's contribution was huge again and, again, Connacht hit the front. From 17-14 they could not push on, however. Goggin bagged his second try of the game by taking up a smart position out wide, as Munster pummelled away near the Connacht tryline, and dotted down after a looping Alby Mathewson pass. Both sides brought on replacements but the Farrells, Chris and Tom, stayed on and were heavily involved until the final whistle sounded. Munster finished the victors but Connacht, at least, got a losing bonus point. Tom Farrell was highly unfortunate to end up on the losing side. It is starting to look like that final Ireland midfield berth will be between the Farrell lads again.